Clockwise from top: Old Yuma City Hall, Ocean to Ocean Bridge, Kofa Mountains, Downtown Yuma, Yuma County administration building, McPhaul Suspension Bridge, Yuma County Courthouse and the Sonoran Desert near Yuma. 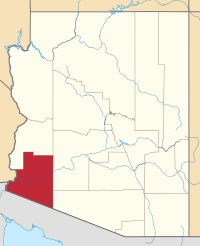 Yuma County includes the Yuma, Arizona Metropolitan Statistical Area. Long settled by Native Americans of indigenous cultures for thousands of years, this area was controlled by the Spanish Empire in the colonial era. In the 19th century, it was part of independent Mexico before the Mexican–American War and Gadsden Purchase. Yuma County was one of four original Arizona counties created by the 1st Arizona Territorial Legislature. [ citation needed] The county territory was defined as being west of longitude 113° 20' and south of the Bill Williams River. 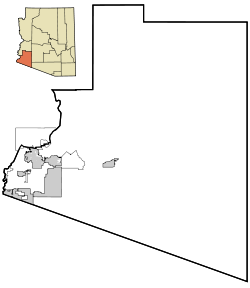 Its original boundaries remained the same until 1982, when La Paz County was created from its northern half. The Board of Supervisors is the governing body of the county and a number of special districts. The board has members from five districts. The Board adopts ordinances, establishes programs, levies taxes, appropriates funds, appoints certain officials, and zones property and regulates development in the unincorporated area. In addition, members of the Board represent the County on numerous intergovernmental agencies. In 2016 county voters elected more Democrats to the Board than Republicans, for the first time since 2004. 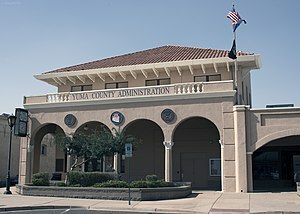 In Arizona's first 52 years as a state, Yuma County was a primarily Democratic county, only voting for Republicans three times in presidential elections prior to 1968. From 1968 on, it has consistently voted for Republican presidential candidates. However, their margins of victory have been reduced in recent years as the county has rapidly grown in population & become majority-Hispanic. Donald Trump only won the county by 560 votes over Hillary Clinton in the most recent presidential election of 2016. According to the U.S. Census Bureau, the county has an area of 5,519 square miles (14,290 km2), of which 5,514 square miles (14,280 km2) is land and 5.1 square miles (13 km2) (0.09%) is water. The lowest point in the state of Arizona is on the Colorado River in San Luis in Yuma County, where it flows out of Arizona and into Sonora in Mexico. As of the 2000 census, there were 160,026 people, 53,848 households, and 41,678 families residing in the county. The population density was 29 people per square mile (11/km²). There were 74,140 housing units at an average density of 13 per square mile (5/km²). The county's racial makeup was 68.3% White, 2.2% Black or African American, 1.6% Native American, 0.9% Asian, 0.1% Pacific Islander, 23.6% from other races, and 3.2% from two or more races. 50.5% of the population were Hispanic or Latino of any race. 43.7% reported speaking Spanish at home . There were 53,848 households, out of which 36.9% had children under the age of 18 living with them, 62.3% were married couples living together, 11.2% had a female householder with no husband present, and 22.6% were non-families. 18.5% of all households were made up of individuals and 8.9% had someone living alone who was 65 years of age or older. The average household size was 2.86 and the average family size was 3.27. In the county, the population was spread out with 28.9% under the age of 18, 10.0% from 18 to 24, 25.6% from 25 to 44, 18.9% from 45 to 64, and 16.5% who were 65 years of age or older. The median age was 34 years. For every 100 females there were 102.00 males. For every 100 females age 18 and over, there were 101.10 males. The median income for a household in the county was $32,182, and the median income for a family was $34,659. Males had a median income of $27,390 versus $22,276 for females. The per capita income for the county was $14,802. About 15.5% of families and 19.2% of the population were below the poverty line, including 27.9% of those under age 18 and 8.7% of those age 65 or over. Map of Yuma County showing incorporated and unincorporated areas as well as Indian reservations in the county. ^ This comprises 359 votes (33.7%) for Progressive Theodore Roosevelt, 189 votes (18.2%) for Socialist Eugene V. Debs, and 5 votes (0.1%) for Prohibition Party candidate Eugene W. Chafin. ^ Wagoner, Jay J. (1970). Arizona Territory 1863-1912: A Political history. Tucson: University of Arizona Press. p. 58. ISBN 0-8165-0176-9. 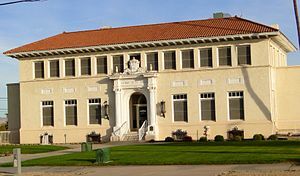 ^ "Board of Supervisors | Yuma County". www.yumacountyaz.gov. Retrieved 2018-03-29. ^ "DP02 SELECTED SOCIAL CHARACTERISTICS IN THE UNITED STATES – 2006-2010 American Community Survey 5-Year Estimates". United States Census Bureau. Retrieved January 20, 2016. "Cross-Border, Cross-Purposes". The Economist. August 27-September 2, 2005.